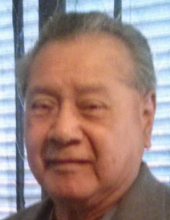 Celebrating the life of Ruben Vera Bustos, Sr.
Obituary for Ruben Vera Bustos, Sr.
Ruben Vera Bustos, Sr., a resident of New Braunfels, passed away on Sunday, November 18, 2018 at his home at the age of 82. Ruben was born on March 15, 1936 in New Braunfels to the late Alberto Bustos and Maxima Vera Bustos. During his professional career, and after some 22 years of dedicated service, Mr. Bustos retired from Boeing Electronics as a supervisor. He is survived by his children, Oscar Bustos, Sr. and Maria Lopez, Diana Bustos and Ruben Bustos, Jr. and wife, Veronica; grandchildren, Alberto Bustos and wife, Melanie, Oscar Bustos, Jr. and wife, Crystal, Jessica Chavez-Castillo and wife, Cristy, Jacob Medina and wife, Iris, Eric Daniel Medina, John-Marcus Munguia and Kayla Medrano, Theodore Rivera, Roxanne Ayala and husband, Joe, Ruben Bustos, III and wife Jimena, Marisa Bustos, Anjelica Bustos, Kevin Bustos and David Esperanza; 19 great-grandchildren and three great-great-grandchildren. In addition, Mr. Bustos is survived by his sister, Mary Montanez and husband, Felix and numerous nieces and nephews. Visitation will be held from 5:00 PM to 8:00 PM with the recitation of the Holy Rosary at 7:00 PM on Sunday, November 25, 2018 at the Lux Funeral Home Chapel. Visitation will resume from 9:00 AM to 10:00 AM on Monday, November 26, 2018 at Holy Family Catholic Church, with the Mass of Christian Burial celebrated at 10:00 AM. All services will end at the conclusion of the Funeral Mass. To send flowers or a remembrance gift to the family of Ruben Vera Bustos, Sr., please visit our Tribute Store. The recitation of the Holy Rosary will begin at 7:00 PM on Sunday, November 25, 2018 at the Lux Funeral Home Chapel. Mass of Christian Burial. All services will end immediately following the Funeral Mass on Monday morning. "Email Address" would like to share the life celebration of Ruben Vera Bustos, Sr.. Click on the "link" to go to share a favorite memory or leave a condolence message for the family.